Giovanni Rizzo won the Great eastern Run four years on the trot. And he could well have made it a famous five had it not been for an achilles injury suffered in 1993. 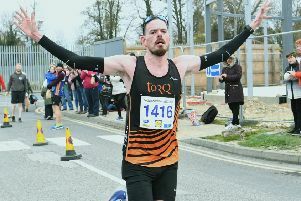 Other local winners were former Commonwealth and European marathon champion Ian Thompson (he was living in Bourne at the time), Stamford’s Laurie Reilly, Nene Valley Harrier Tony Green, Holbeach Athletic Club’s Mike Exton, and RAF Wittering fireman Kevin Best. Ramsey mum Teresa Dyer twice won the women’s race, in 1993 and 1994, as did fellow British international Gillian Castka from Oundle. Nene Valley Harrier Tina Lazenby was an easy winner in 1988. Karen Fulgum, an American based in Huntingdon, was another local winner, winning the race in 1984 and 1985.